Better to let the doctors take care of her. We can’t cure her! HL came to see us on behalf of her 70-yer-old mother who was diagnosed with T-cell lymphoma. Her mother had been in the hospital for the past 2 weeks. She needed blood transfusion every 2 days because her platelets count was down to 1.0 (normal range 150-400). Her red blood count had stabilized at 8.0. For the past 1 week HL’s mother was given steroid injection. The doctor suggested chemotherapy and this would be a 50:50 chance. The idea is to “control” the cancer. If the patient does not want chemo, it is okay. But according to the doctor it would be a “hopeless” case. She could stay in the hospital to receive supporting treatment, such as blood transfusion, etc. when needed. Desperate and not knowing what to do, HL came to seek our opinion. Listen to our conversation that day. Gist of what we talked about. We hope that all who come and seek our help learn this too. What can we do with her platelets so low. Let her stay in the hospital and let the doctors take care of her. They have all the facilities to assist her. The doctors did not pressure the family to do chemotherapy — they are open. To do chemo, they claimed it would be a 50:50 chance (of what?) but not to do chemo it would be a case without any “hope”. The daughter asked the doctor: Her condition is deteriorating, can she stand the chemo? The doctor said it would a modified low dosage. The question to ponder: Even when you give full dosage, you cannot cure the cancer, what do you expect to get with a low dosage? The doctor said chemo is just to suppress or control the cancer. To put the cancer cells to sleep. Daughter was very concerned about the side effects of chemo but someone told her that chemo had to be done to cure the cancer first. Only after the cure, then she can try natural therapy. 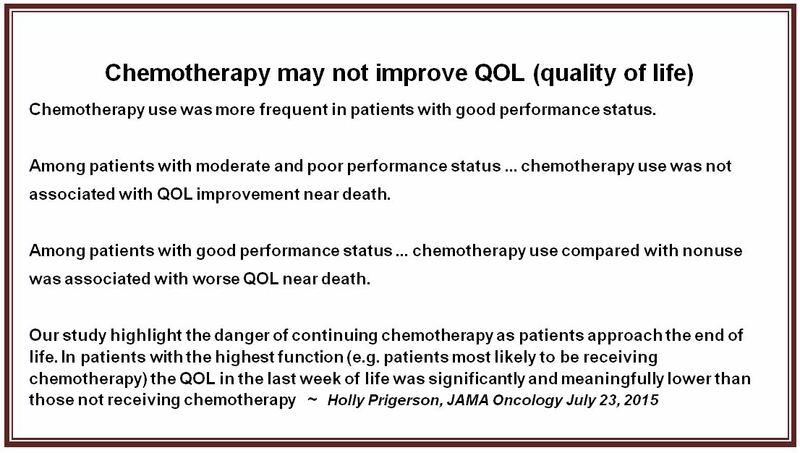 Question to ponder: What happen if the chemo kills the patient right away? With your mother’s condition — platelet = 1, did you ever ask the doctor if your mother is going to be able to survive the chemo treatment? Can it kill her right away or not? Reply: Yes, that’s our worry too. I would be very happy if the chemo does not kill your mother. But know that nobody can cure any cancer. When you come and see us, don’t ever believe that we are going to be able to cure your mother’s cancer. 10.Since your mother is now in the hospital, let her stay there and you should follow the doctors’ instructions. Don’t take our herbs. Because if anything goes wrong, after she takes the herbs, you are going to blame us. Many people are like that. They sent us e-mails asking if our herbs caused these problems or that problems. And their cases were already medically given up. For this type of people I say — Please don’t come and see us. When you take our herbs, you may feel unwell first (healing crisis) before you start feeling better. Know that everyone has to die. Today, I am not sick but I may also die tomorrow. That is the reality. It is a fact. With your mother’s condition like that, platelet = 1, what is the chemo going to do for her? Daughter: That is why the oncologist said there is only a 50:50 chance. You have to decide, she is your mother. Daughter: There is no other solution. Do chemo, your mother may die, don’t do chemo she may also die. Let me remind you. If you don’t do the chemo and if your mother dies, people will blame you and you are going to regret. If you do chemo and she died you will also regret. In life you cannot win all the time. And I know, in cancer, most people are going to lose. So go back, take time and discuss with your two brothers and sister. Decide what you want to do. You come here wanting herbs, believing that these are going to cure your mother — forget about that. Our herbs are not magic. We cannot cure her cancer. That is why I ask you to go home and think about what you want to do. Daughter: With my mother’s condition like this, we cannot wait! Aya, always want to win! There is still time. Daughter: You mean the herbs cannot cure her? Cure cannot — how can? I don’t see how our herbs can help her. You expect the platelets to go up by tomorrow after taking the herbs? No way. Daughter: Can she just take the herbs for a while? Well, what do you say if she dies? Daughter: Are there any herbs to strengthen her body now? There is no magic bullet. Daughter: While doing the chemo, no need for her to take herbs? NO. Because if anything happens, the doctor is going to blame the herbs. Daughter: Can she take your herbs after her chemo? We will wait and see what happen first after the chemo. You pray to who? Reply: Buddha. Okay, go home and pray to Buddha. Ask Buddha for an answer — now that my mother is in this condition, Buddha can you help me and tell me what shall I do now? If Buddha says do not go for chemo then you can come back and see me again. But if Buddha says she goes for chemo, then go ahead and do the chemo. This is the only sensible advice I can give you. There is this lady from Indonesia. She was scheduled to do chemotherapy on Monday. But on Friday she came to see us. She was not happy with chemotherapy. I told her to go back and pray to Jesus (since she is a Christian). Ask Jesus to tell her what she should do — go for chemo or not. We did not give her any herbs yet. On Monday, she came back and said God has given her the answer. She would not go for chemo. Only then we gave her the herbs. I am telling you to do the same thing. Go home and pray to Buddha and ask for guidance. By doing this, you cannot blame anybody anymore. And you will be at peace with yourself. We respect all religions. Many people came here and told us that Buddha asked them to come and see us. Some said Kuan Yin asked them to come. And some Christians said God showed them the way to see us. Let me say again, we cannot answer all the questions you asked. Nobody can answer all the questions either. The One who can answer you is Buddha. So go home and take time to pray to Buddha. Ask one simple question — What do I do now. I am lost. I have been praying to You for so long. Please let me have Your guidance. Follow your heart, not your brain. Now, there are millions of people out there. Ask them and you get a million answers. For now, don’t take our herbs yet. Like your mother I am just as desperate. I am also in the hole. I give you the herbs … that does not seem right. My conscience is not clear. And I also cannot sleep. Many patients and their family members are often made to believe that chemotherapy — even if it cannot cure cancer — can prolong life and can control the cancer from spreading. They are also told that chemotherapy can also promote patients’ quality of life. Do you believe all these? Ask those who have undergone chemotherapy and see what they have to say! Some told us they went through “hell” while undergoing chemotherapy but so far no one has yet tell us that undergoing chemo is a “heavenly” experience. Yes, some patients did say they did not suffer much during their chemo. Some said they could tolerate the chemo. But some others said after one, two or six shots of chemo, their loved ones just died. So, in chemo it is always, to each your own. To say that chemo would prolong your life or improve your quality of life — as in the case above — may be stretching the imagination a bit too far. Research has shown that these claims are not necessarily true. On the contrary even the American Society of Clinical Oncology acknowledged that in some or most cases, chemotherapy was wasteful and unnecessary, in cases where cancer was too far advanced. Perhaps you may wish to ponder seriously the advice of Drs. Blanke & Fromme below. 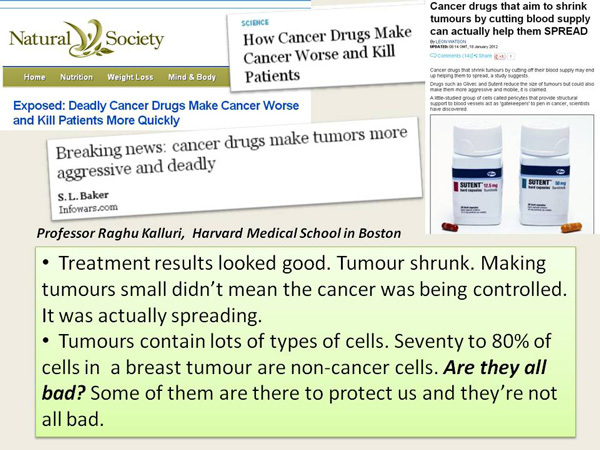 What about the claim that chemotherapy can stop the cancer from spreading or make the cancer cells go to sleep? It is indeed most shocking to know what some cancer researchers tell us. 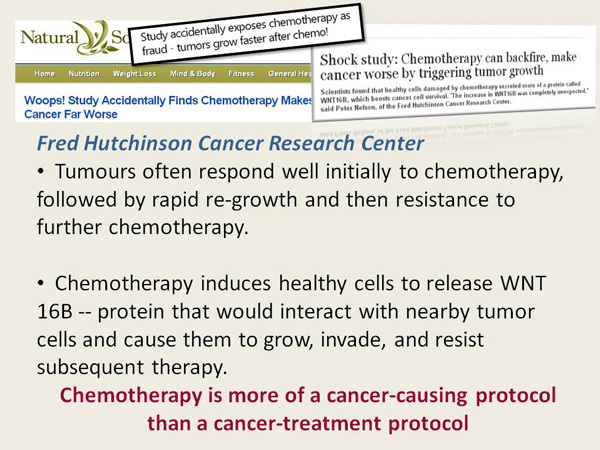 Read this: Chemo spreads and makes cancer more aggressive. When patients come and see us. Please show us your commitment and show us that you really believe in what we are doing. Of course, you can come here for “shopping” — just to know what to do, but we want you to go home after that to make your own decision. Please do not ask us to decide if you should go for chemo or not. Also do not come saying my doctor said this or my doctor said that. We know in cancer there is no right or wrong answer. So it is no use commenting of what others say you should do or not do. Know that YOU, and you alone must decide what you want to do with your cancer. We can only provide up to date, honest information, but whatever you want to do after that must be your own decision and your responsibility. This entry was posted in Success Story and tagged chemotherapy, lymphoma, near death by CA Care. Bookmark the permalink.